Did you know you want a vintage cast iron skillet ? Maybe you did and maybe you didn’t but after reading this post I think you will want one! I apologize in advance for tempting you with visions of the perfect new addition to your kitchen ;-). Cast iron is a must have for all southern cooks, but you probably already knew that. What you don’t know is why Grandma’s cast iron skillet is better than the one you have. Southern cooks use cast iron skillets for all manner of fried dishes as well as quick breads. Before I discovered cast iron cookery, both enameled and raw cast iron, I had a love/hate affair with my stainless steel pans. I loved the healthy aspect of them, but often burned the outside of meat and left the inside undercooked. I was pretty new to this whole cooking thing and everyone I knew had teflon pans so no insight there :-). Then I was given a salsa recipe that absolutely insisted that you blacken the peppers in a cast iron pan. I was inspired to get one. So I bought a smallish square Lodge pan. And it was great! I made salsa, quiche, cornbread and fried everything in it but eggs. But was never able to season that pan well enough to be completely non-stick. Maybe it was just my particular one … the surface was pretty rough. Also, I wasn’t the kindest to it, so maybe it just never got really well seasoned. Or maybe it’s just a bit trickier to get a non-stick surface from a modern machined cast iron pan. Most if not all of the cast iron you’ll find available new is made by Lodge. These pans have a very rough surface in comparison to quality vintage pans. So while cast iron is cast iron there is a difference in the quality of the machine work. All Lodge pans come pre-seasoned with a soy based vegetable oil now. Many are stripping this finish to apply their own seasoning. One of the advantages to new cast iron has always been that you can easily start fresh with your own seasoning. Looks like that is no longer true! 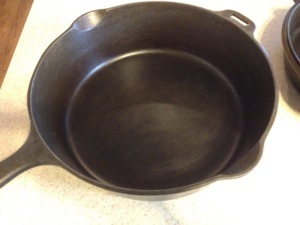 And you can always start fresh with a vintage pan by strippin it of seasoning too. No doubt many cooks are quite happy with their Lodge pans as I was for years. But I think most of them haven’t seen or cooked with either a Wagner or Griswold vintage pan . These are the two big names in quality vintage cast iron cookware. Both brands can be easily found used. Simple fry pans are the most abundant and are usually priced pretty reasonably. vintage pans on eBay should run around $50-60 for one in good condition. My double skillet shown pictured on the right is a little bit more than the price of two pans, but not by much. But Griswold and Wagner aren’t the only quality pans. Take a look around at thrift shops or antique malls and you’ll find many others. To assess the quality look carefully at the smoothness of the interior. It should look and feel very smooth. If buying online I’d stick with Wagner and Griswold since you won’t have a chance to inspect it in person. I bought mine on eBay rather than engaging in the treasure hunt, but I don’t know, maybe that would be more fun :-). 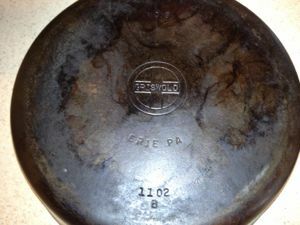 Black Iron Dude – More about Griswold Cast Iron with some great photos! The Healthy Home Economist – Questions the use of cast iron in light of concerns over excess iron intake. Personally, I feel the risk is pretty minimal. Cooking In Cast Iron – Tips for Cast Iron.